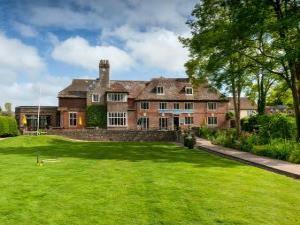 Deans Place Hotel HotelSituated on the southern fringe of the village, this friendly hotel is set in attractive gardens. Bedrooms vary in size and are well appointed with good facilities. A wide range of food is offered including an extensive bar menu and a fine dining option in Harcourt's Restaurant. Croquet. Putting green. Large gardens. Boules. Deans Place Hotel sometimes limits bookings to 2 or more days. Our Executive rooms are perfect for a leisure break for 2 relaxing in the room or in the hotel public areas and enjoying the whole Deans Place charm and service. At approximately 19m2 Our Executive rooms feature a kingsize bed or Two single beds, private ensuite bathroom, Sitting area, complimentary WiFi, hairdryer, dressing table, 27”flat screen TV, DVD player, hospitality tray, Nespresso machine trouser press, luxury toiletries, crisp linen, fluffy white towels and free onsite parking. These rooms all have gardens views. Executive Room sometimes limits bookings to 2 or more days. 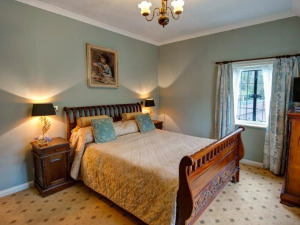 Our double rooms are perfect for a leisure break for 2 relaxing in the room or in the hotel public areas and enjoying the whole Deans Place charm and service. Ourdouble rooms feature a double bed, private ensuite bathroom, complimentary WiFi, hairdryer, desk/dressing table, 22/23”flat screen TV, DVD player, hospitality tray, trouser press, luxury toiletries, crisp linen, fluffy white towels and free onsite parking. Our Family rooms are perfect for a leisure break for a family of 3 relax in the room or in the hotel public areas and enjoying the whole Deans Place charm and service. These family rooms feature a private entrance leading off is your own private ensuite bathroom and two bedrooms with approximately 21m2 total floor space. The main bedroom contains one double, with the smaller second room containing a single bed. Additional facilities include hairdryer, flat screen TV, DVD player in each room, hospitality tray, trouser press, luxury toiletries, crisp linen, fluffy white towels and free onsite parking. These rooms also have space for a travel cot or a child’s z at an addition cost, Request only direct to the hotel. Standard Family sometimes limits bookings to 2 or more days. From Brighton, follow A27 to Alfriston roundabout. Turn right, go past Drusillas Zoo on the left, follow the road into the village. Deans Place Hotel is on the left hand side.